I work at CallRail as a senior product manager focusing on our call analytics reporting and billing systems. I help guide the overall product vision working with other senior product leadership to define our product strategy. I worked at Oracle for 5 years following the acquisition of Vitrue. While there, I lead a team to develop the iOS mobile application for Oracle SRM as the development lead and product owner. I also took over the product management role for the analytics portion of Oracle SRM. My time at Oracle allowed me to change roles away from software development and into a product management role. Over the years I was able to successfully launch several initiatives within Oracle SRM and became a leader within the product management organization. I was the developer for the presidential election app 270toWin. 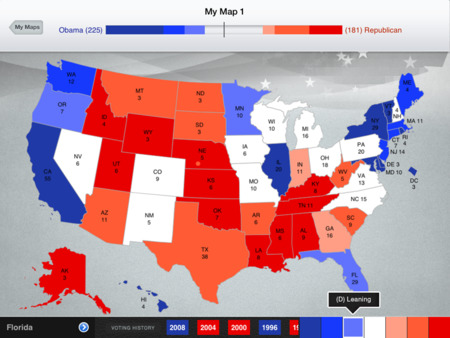 The app allows you to make predictions for the 2012 presidential election by selecting which states will vote for which candidate. The app also has a wealth of historical information on the states and previous elections, all the way back to the first election of George Washington. I worked with Todd Bennings. We worked together to wireframe the application. From there Todd created an excellent design, and I did the development work. The app won a 2012 Atlanta Addy Award as well as being a Webby Honoree. I have been the lead developer on the Georgia Lottery website since June 2010. It's a great opportunity with some tight deadlines and some interesting projects. There are a slew of frameworks and backends in use that all have to integrate and talk with one another. This portion of the Coca-Cola corporate site is devoted to providing members of the press with high quality footage from Coca-Cola. This footage includes commercials, sustainability videos, and B-roll.